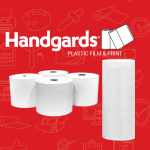 Handgards is completely integrated in its polyethylene glove manufacturing process, thus assuring total control from receipt of resin to shipment of product. Handgards also complies with all good manufacturing practices. We have gloves available in embossed and smooth textures. Embossing creates tiny air pockets permitting air to circulate around the hand. Handgards 100% Latex Rubber Reusable gloves have textured grip, are perfect for light to medium-duty janitorial chores and housekeeping tasks.